By now, some of you will have downloaded the Visio 2010 Beta (http://visiotoolbox.com/2010/), and may even have downloaded the Visio Automation Reference and ShapeSheet Reference files from http://www.microsoft.com/downloads/details.aspx?displaylang=en&FamilyID=2baf54a3-bbde-4cb8-b0e6-19005939db6a. You may the, like me, wondered how to actually view the contents of these two hxs files? Well, fortunately, Stephanie Horn from the Visio team at Microsoft as able to help, so I thought that I would pass it on to you. (Remember these files are still beta, but they do contain some useful information). 1. Rename the files VISIO.DEV.HXS and VISIO.SHAPESHEET.HXS, respectively, and put them in your Office141033 directory (i.e., C:Program FilesMicrosoft OfficeOffice141033). 2. Open Visio, and launched help (F1). 3. 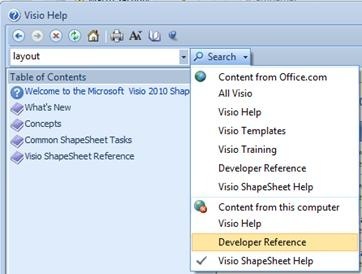 Pick “Developer Reference” or “Visio ShapeSheet Help” in the Search pull-down menu. I suggest turning on “Show Table of Contents” using the book icon in the toolbar, so you can navigate through the help topics.